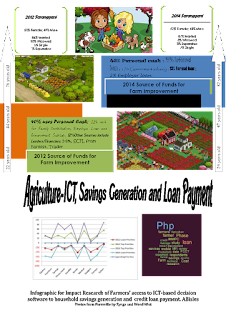 This blog post presents some of my research findings through a FarmVille inspired info graphic. In it I compare the rules and features of the game to actual practices of savings, loan repayment and provision of government technical assistance for agriculture and farm improvement in the Philippines. FarmVille was introduced on Facebook in 2009 as an online farming simulation social network game that teaches players to use available resources for generating maximum farm productivity. It requires the players to be involved in different farm management activities such as planting, plowing, growing and harvesting crops and trees, and raising livestock. FarmVille’s popularity soared on Facebook between 2009 and 2011 and appears to have contributed significantly to an awareness on aspects of farm management among online gamers all over the world. The game is available free to players but in order to progress quickly to higher levels in the game, the players have to amass Farm Coins, an income they can earn through activities within the game that include tending to their farm and harvesting crops or by spending Farm Cash which can be purchased in real-world currency. Farm Coins and Farm Cash are the two in-game currencies and the greater the amount of this “money” the farmer has, the larger her/his purchasing power in the “market” where items (such as seeds, trees and animals, decorations, buildings and a massive range of other items) can be purchased using these currencies. The use of coins and cash, alongside acts of social capital (neighborly work and gift exchange) provide the main mechanism for in-game activity which frames social engagement between the players while also providing the crossover between virtual and real currency exchange in FarmVille. The research project was concerned with conducting an impact study of agriculture information communications technology (ICT) on savings and loan repayment in the Philippines among research grantees of the Microfinance Innovation Center for Resources and Alternatives (MICRA) and Economic Social and Cultural Rights-Asia (ESCR Asia) through two microfinance institutions (MFIs) in Sarangani and Cebu provinces for the period 2012 to 2014. Both the MFIs under consideration had existing micro agriculture loan programs or agri-based rural micro enterprise promotion programmes and mobile banking facilities for its members at the time of the study. 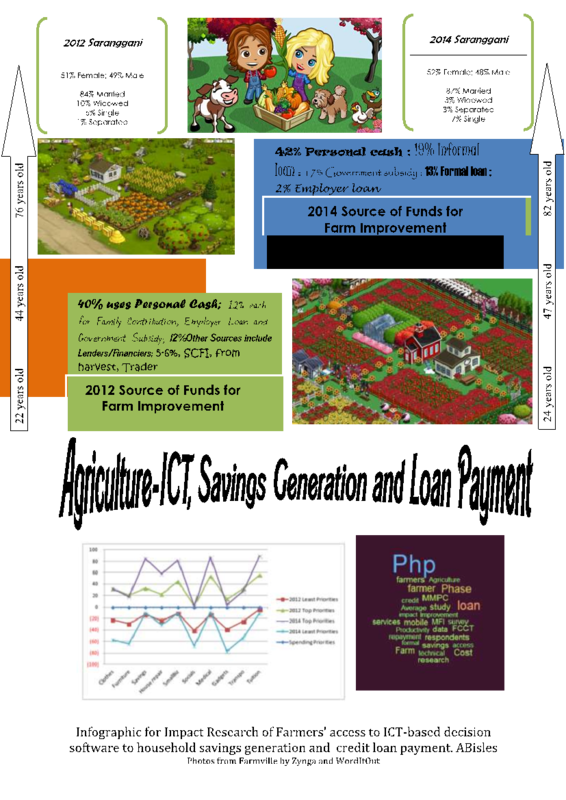 In this infographic using FarmVille images, I visualize the findings from the province of Sarangani over the two years. The infographic shows that during this period the number of female and male farmer respondents were almost the same at 51%, 49% in 2012 and 52%, 48% in 2014. Their status as married, widowed, single and separated also did not change significantly in the two years. In both 2012 and 2014 the majority of farm improvements were sourced from personal cash. However, in 2014 there was a marked 17% increase in government subsidy even as the loans from informal lenders/financiers increased from 12% in 2012 to 19% in 2014. As the graph on the bottom left hand side of the inforgraphic presents, in 2012, medical expenses were ranked highest in spending priorities and socials and gadgets were prioritized the least in both years. In 2014, savings, small business, and tuition became top priorities along with medical expenditures. • A 2011 study conducted by MICRA Philippines for Mercy Corps on Small Holder Farmers showed that farmers' access to credit depended on their location. In this project it was observed that access to ICT services, household savings and repayment capacity did not correlated to whether the area was wealthy or poor. • Sarangani is among the poorest provinces in the country and Cebu features among the more advanced cities in the country. In Sarangani, the MFI clients registered 75% willingness to deposit and withdraw cash through mobile banking while at Cebu the MFI registered a much lower willingness at 48%. This shows that farmers access ICT services, inclination to save and make repayments depends not so much on their location but on their willingness to use mobile phone technologies. • Farmers need human intermediaries to facilitate the learning process and actual use of ICT services. Even though the MFI in Cebu had a history of capacity building around mobile banking, a large number of its farmer client base was not as willing to use mobile phones to save and make credit repayments. The MFI in Sarangani on the other hand, had farmer clients that were already users of ATM services and were graduates of the Farmer Field School (FFS) trainings conducted by the Department of Agriculture (DA) that promoted agriculture extension services through e-Agriculture. As respondents in Sarangani become more aware of the benefits of mobile banking through the farmer field school and MMPC information campaign, there was an increase in MMCP clients’ willingness to deposit and withdraw cash through mobile from 75% to 83%. •The respondents with P5,000 and above average monthly income were mostly willing to deposit and withdraw cash using mobile phones. Income level was a key determinant in loan repayment capacity and willingness to use mobile phones. The MFI in Sarangani had a P5,000 average monthly income as minimum criteria for availing the loans which was maintained and even increased loan repayment performance. In FarmVille, there are several informational features and applications that assist and enable players to progress to higher levels of farm productivity. For instance, players can avail of agricultural technical assistance that is featured in the form of cold storage warehouse facility, registration/enlistment to some technical services, certification and clearances that help them to gear up to the next stage of agricultural technical assistance like provision of credit, marketing and facilities among others. FarmVille also has a “Help Center” where tips and guides are posted for players’ information and reference. In the actual world, MFIs can be critical in educating farmer clients and increasing exposure on the use of the technology and further developing farmer entrepreneurship through ICT services. Thus, agricultural technical services can be further developed in collaboration with the MFIs as another income generating activity and “handholding” assistance for the farmers that would ensure their productivity and ultimately loan repayment capabilities and lead to increase in savings. This study, thereby notes that in order to be more effective the MFI needs to emulate ideas from FarmVille in order to facilitate the learning process and actual use of ICT services and mobile banking in social practice. A fun platform like FarmVille has also demonstrated the technological capacity to spread awareness regarding various aspects of farm management. Similar ICT initiatives can be utilized for MFI capacity building initiatives whose impact will trickle down to the farmers. “Sachet information” can be sent out to farmer mobile users to increase their capacity in agriculture extension services at a faster pace and lesser cost. For instance, the International Rice Research Institute (IRRI) launched the Crop Manager application through which it sent customized crop and nutrient recommendations to farmers. The use of ICT services in educating today’s youth on the benefits and prospects of farming also allows them to understands basic principles of savings and loan repayment by which they can earn their living and further invest in farm improvement.